Laparoscopic sleeve gastrectomy (SG) also known as laparoscopic gastric sleeve surgery is a procedure in which a portion of the stomach is surgically removed. The procedure is performed on obese and morbidly obese patients to cause weight loss and resolve or improve overall health with respect to obesity related co-morbidities such as diabetes, sleep apnea, osteoarthritis, gastroesophageal reflux disease, and hypertension. Sleeve gastrectomy is slowly gaining wide acceptance as an independent surgical procedure for treating obesity. This procedure is typically performed laparoscopically and unlike the Lap-Band, is a non-reversible procedure. 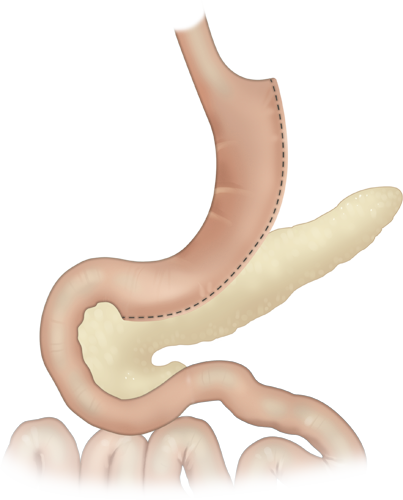 It is named 'a sleeve gastrectomy' because of the sleeve that is formed by surgically stapling the edges of the stomach. The stomach size can be reduced to as little as 15% of the original size. The small size is achieved by dividing the stomach on its vertical axis and preparing a small, long pouch. As a result of this surgery, a person feels fuller upon eating a relatively small amount, body metabolism is altered and the craving for food is reduced. What happens during laparoscopic sleeve gastrectomy? Laparoscopic sleeve gastrectomy is a restrictive procedure that reduces the size of the stomach but does not alter the gastrointestinal tract or the pylorus. Because the route of ingested food through the gastrointestinal tract is not altered, nutrients are better absorbed. The patient is less dependent on vitamin supplements as the food is absorbed in a more natural manner. The long-term effects of this procedure on nutrient absorption need to be better understood, particularly because the size of the stomach can be reduced by as much as 85%. The length of the procedure varies between one to three hours. On an average, patients stay in the hospital for two to three days. Similar to other bariatric procedures, return to normal activities and office work usually takes a fortnight. Your post-operative adherence to lifestyle regulations as presented by Dr. Belsley and your surgical team will play a large role in determining the need for a second bariatric procedure in the future. You will be on a liquid and semi-liquid diet during the post-operative period after the surgery. After the first month, there are few concrete food restrictions and a common sense approach and dedication to a life-long diet are necessary. Calorie rich foods and items that are difficult to digest will remain problematic. Smaller portion sizes are advised. You should chew the food properly to ensure that there is less bulk that reaches the digestive system. A balance between the quantity and quality of food consumed along with regular exercise is the key to achieving and maintaining a healthy weight after surgery. When the gastric sleeve surgery is performed as a part of a two-stage procedure, the procedure is termed a staged procedure. Here, the sleeve gastrectomy is performed first as a restrictive strategy for surgical weight loss. A gastric bypass, which would be performed months or years after the first stage, involves changing the route of the food through the digestive tract. A two-staged procedure may be performed if you are extremely overweight and not yet ready for the gastric bypass. You may not be ready for a gastric bypass because of the shape of your body, a history of multiple prior operations, or that you have too many medical comorbidities. The advantage of a two-staged procedure is that you can loose weight after the laparoscopic gastric sleeve so that there would be less hypothetical risk for the gastric bypass performed at a second stage. What are the differences of laparoscopic sleeve gastrectomy versus laparoscopic gastric bypass? During gastric bypass, the original stomach is left in place. Food travels from the pouch directly into the re-routed intestines. During sleeve gastrectomy and unlike during gastric bypass, the remaining stomach is removed. Food therefore travels along its original path. The fact that the food does not empty directly into the small intestine helps prevent dumping syndrome that sometimes occurs after gastric bypass. There are hypothetical benefits with hormonal changes responsible for satiety after laparoscopic sleeve gastrectomy. For example, a portion of the stomach that is removed produces Ghrelin which is thought to play a role in causing a person to feel hungry. Although not yet completely understood, with less stomach, there should be less of this hormone and therefore a decrease in the feeling of hunger. The procedure originated as a bridge or preliminary operation to gastric bypass surgery, however today is often performed as a stand-alone definitive surgery. Laparoscopic sleeve gastrectomy represents an additional surgical option in high-risk patients who cannot be exposed to the rigors of a gastric bypass operation. In this setting it could be used as a risk-reduction strategy in a staged bariatric procedure for high-risk patients. Data gathering on the sleeve gastrectomy is an ongoing process. Present results from research on the effects of the procedure show that weight loss from sleeve gastectomy is less than what is achieved after gastric bypass and probably higher than what is possible with Lap-Band surgery. Over the years, improved clinical outcomes in terms of weight loss and controlling comorbidities has resulted in greater acceptance for laparoscopic gastric sleeve surgery not only for the super-obese but also for obese patients with a lower BMI. The simplicity of the procedure, durable weight loss, and fewer post-operative restrictions on diet are reasons why laparoscopic sleeve gastrectomy is gaining scientific acceptance and now represents a surgical options to treat morbid obesity.